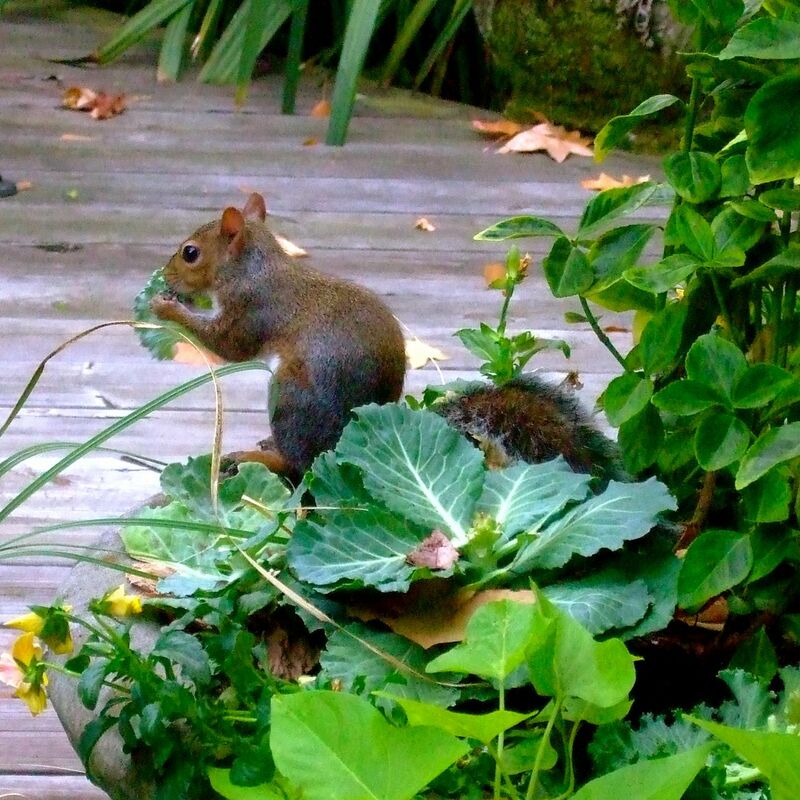 This is a photo taken last fall, when I had pansies and ornamental cabbages, among other things, in the pots on our deck. This little lady helped herself. She was a picky eater! I sat here and watched her nibble on a leaf and toss it, nibble on another and toss it. Finicky. But we let her have those cabbages. Cute!! We have squirrels, too. They just love to eat all the bird seed. 😉 It drives my son crazy, but I just let them eat it. I figure, I put the seed out to attract wildlife. Birds and squirrels both qualify. I don’t mind them unless they keep the birds away. OR destroy the feeders! I’ve got caterpillars eating in my vegetable garden this summer. I did a little research and decided to leave them be. The pretty one will grow up to be a black swallowtail butterfly. She’s eating more of my parsley than I would like but, yeah, a black swallowtail butterfly. The not so pretty one is doing a better job keeping my out-of-control tomatoes bloomed than I was and it will grow into a plant-pollinating moth. I decided I had enough to share. Maybe you’ll get a good shot of the black swallowtail when it emerges and share it with us! I have some black swallowtail butterflies that are always on my butterfly bush by my front porch. Check back here on Thursday for photos. Right, Gerry? Cool! Looking forward to it. My source (http://www.cafejohnsonia.com/2008/06/whats-eating-my-parsley.html) says they like parsley as caterpillars and butterfly bush as butterflies. love the pic! but i feel your pain – we have deer that eat every one of my hostas! No deer around here! We live in town, so the closest we come to wildlife is an occasional raccoon, possum, or rabbit. We’ve had raccoons and possums come right up on our deck, all the way to the French doors in the den, and look in at us! Bold little rascals. i live in town, too! we live next to a forest, and the deer think they own the place! little rascals indeed. It’s only wrong if they belong to someone else and you tossed them to her. *L* Many years ago I let six caterpillars munch on a beautiful fennel plant I had in my garden, so my girls could see first-hand the life cycle of a butterfly. One morning they were gone, replaced by six little cottony cocoons. I was so excited! I couldn’t wait for the girls to come home from school so they could see. By the time they came home, every last cocoon was gone: something had come in the day and eaten them! Ouch! That’s a hard lesson, isn’t it? I have a friend who took cocoons inside, put them in a protected environment, and watched them hatch. She documented the process with photos. Amazing stuff. Then she and her son let the butterflies go (of course; I guess that goes without saying). Sometimes the theft is the price we pay for our ticket to the show. You decided that the squirrel watching had more value than the view of precision in a late garden bed. Can’t say I’d blame you there. Augustus and Octavius were the names of my two pilfers who loved my every-blooming strawberries after strong winds put an early end to my mulberry tree and its season of bounty. I would enjoy watching them over my morning cup of coffee. I believe they made all of the berries taste sweeter that year. So true. This little guy was really funny. I said “she” in the post because, I guess, I like the idea of the little female needing that nourishment more than an aggressive male. S/he would pick an entire leaf, take one little bite, and throw it down, then pick another and do the same thing. It didn’t take long to strip the plant! S/he was cute, but squirrels can be so destructive in the garden!